This is the most fantastic combination of rich chocolate with spicy chilli. South Americans have been matching these ingredients for centuries - we are just catching on! 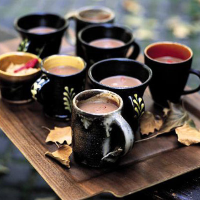 If you'd prefer not to use chilli, the hot chocolate will still taste delicious without it. Pour the milk into a saucepan. Carefully slice the chillies in half lengthways and deseed, leaving the stalks attached in order to remove them from the milk easily. Add to the milk. Slowly bring to a shivering simmer. Remove from the heat and infuse for 10 minutes, so that the milk takes on the chilli flavour. Reheat the milk, add the broken chocolate and cream and stir on a low heat until the chocolate is dissolved. Remove and discard the chillies. Serve garnished with a slice of fresh chilli.